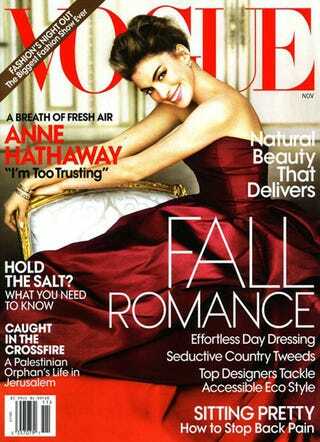 At least, the Mario Testino shot of Anne Hathaway lolling about (a bit awkwardly) in burgundy looks a lot better than her last Vogue cover. But the cover line, "I'm too trusting" may just be the understatement of the century. Anne Hathaway&apos;s Breakup: "Not A Part Of My Life Anymore"